the location and causes of leakage in order to take measures to troubleshoot. show % of cylinder leakage or cylinder leakage and cylinder pressure .Suitable for use on any petrol engine with 14. 12 or 10mm spark plugs.Supplied in carry-case with instructions. it can pinpoint the needed area of attention. A leak down test is performed with a special gauge and manifold set. It consists of a calibrated pressure gauge and a pressure regulator and adapters to connect it to the spark plug hole. Compressed air (or nitrogen) is fed into the gauge and the gauge is calibrated against a zero reference (no air leakage). The adapter is then screwed into the number one spark plug hole (with cylinder #1 at TDC compression) and the gauge is attached. As soon as the gauge is attached to the adapter air will begin to fill the cylinder. As this happens, the gauge will begin to indicate the amount of air flowing into the cylinder. If air is leaking past the rings, or the valves, or the head gasket, we can directly read the amount of leakage and can easily find the leak. A leak down test is especially good at discovering leaky valves. We use much less pressure (about 80 psi) than is normally in the combustion chamber (several hundred psi). 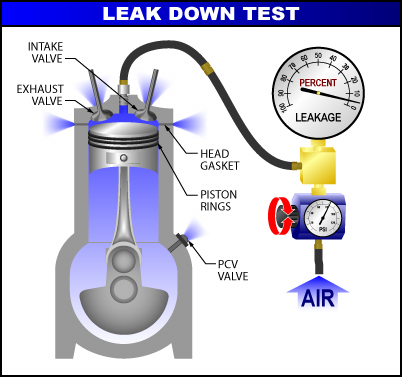 If there is a valve that is slightly off its seat, the actual combustion pressure may have helped close it, but the lower testing pressure won't exert as much force and the leak will be apparent. This test is very time-consuming with the engine in the car. To do the test, each cylinder must be tested one at a time, they must be at TDC compression, and the crank must be held in place to prevent rotation. A freshly rebuilt engine should have less that 4% leak down on each cylinder and if leak down is above 10%, service should be performed. All cylinders should be within 2 percentage points of each other. NOTE: These figures are for performance engines. Stock production engines may have as much as 10% right off the assembly line. If you ask your shop to do a leak down test, they may offer to do a compression test or may hesitate or quote a high price for the work. This is not uncommon -- it is not a simple task. If the shop that you use doesn't know what a leak down test is, then you should leave quickly and politely and never return. They do not have the proper diagnostics knowledge to be working on your engine. Controlled air pressure is applied to the suspected cylinder (at TDC—Top Dead Center) and the rate at which it leaks out of the cylinder is measured. The gage, which functions as a flow-meter, shows the amount (%) of leakage so that you can evaluate the seriousness of the problem. 1.Tail pipe ....................... for exhaust valve leakage. 2.Carburetor air horn ...... for intake valve leakage. 3.Adjacent plug port ....... for head gasket leakage. 4.Radiator filler ............... for cylinder wall cracks. 5.Oil dip stick tube .......... for ring/cylinder wall leakage. Even in a perfect engine, there will always be a certain amount of ring leakage due to the ring gap. This is the only place where leakage is allowed. Thus, you should always hear leakage at the dip stick tube—but never any place else. The gage, of course, shows you whether it is normal or not. 1. Connect the instrument to shop air pressure (50-150 PSI) and adjust the regulator until the gage reads in the middle of the SET band, before connecting flexible adapter. 2. With all plugs removed (the normal case, since this test usually follows a compression test), set the cylinder in question to approximately TDC on thecompression stroke. This is easily done by observing the distributor's rotor and reluctor position. The rotor points to the cylinder coming up on compression. instant the points OPEN, assuming that the timing is set to approximately TDC. Use a dwellmeter to indicate point opening. excessive, localize the source by listening at the above mentioned locations. rotor/reluctor position as above to indicate TDC. NOTES ON LEAKAGE TESTING. . .
A. A mechanic's stethoscope, with the probe removed, makes a good listening device. So does a length of heater hose. To avoid false indications, do the listening in as quiet a location as possible. B. The greater the leakage, the lower will be the pitch of the leakage sound. C. There will always be leakage past the rings (and leakage sound at the dip stick tube). Use the leakage readings to evaluate it. D. However, a burned exhaust valve, for example, which can be heard at the tail pipe, may divert the normal ring leakage and you may hear very little sound at the dip stick tube. E. Do not expect to get exactly the same gage readings when making repeat tests on the same engine. A reading variation of 10% is normal. These variations are caused primarily by changes in engine temperature and piston position from the previous test. F. For consistent results, try to position the piston a few degrees before TDC. Once the piston passes TDC, the rings press against the top of the ring grooves and may alter the test results.